I have a dilemma. I found this yarn a few years ago on the Discontinued Name Brand Yarn site and when I saw it I knew I had to have it as it had all my favorite colors in it. It’s Maiden by Wool in the Woods dyed by Cherry Tree Hill in the color of Martha’s Vineyard. I wanted a pattern that would be simple and not compete with the yarn. The pattern Upside Down Scoop Neck Tee is perfect for this. I swatched the yarn and had the correct gauge and after checking the yardage I had enough to knit the sweater with one ball left over. However, something’s not right. I have only two skeins left and I had planned on using one each for the sleeves and I’m not even finished with the sweater itself, not to mention that the neckband needs four rounds. 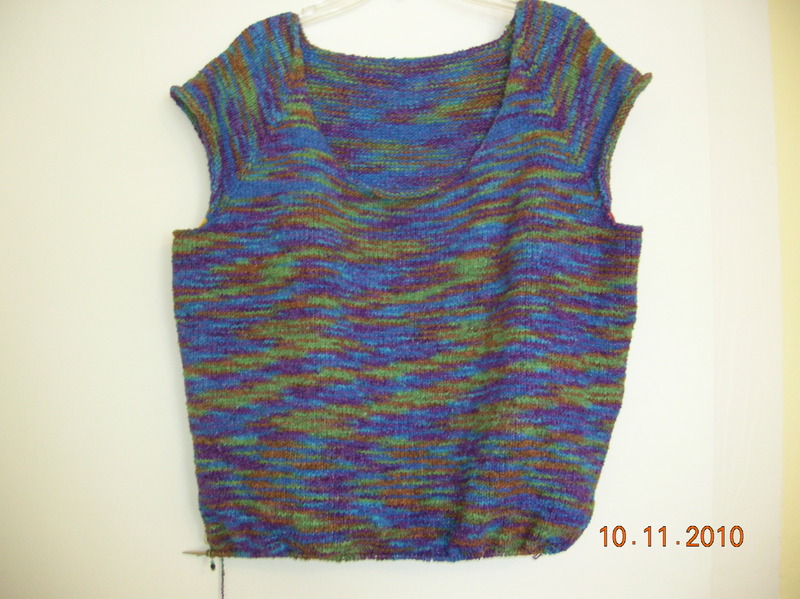 Another thing, I thought this would make a great summer sweater but about 10 rows below the neckline, I realized this would be too heavy for the summer unless I was in air-conditioning cold enough to be a meat locker. The fabric is heavy and close-knit and I’m wondering if it’s too much to wear even for the Southern winter. Something else to consider, I’ve lost a lot of weight since I started and it may not fit properly. So the million-dollar question is this? Do I frog it and try knitting it with larger needles in a smaller size, or mush on hoping I end up with enough yarn? I cringe when I think of all the time spent on knitting this but my husband says to consider it occupational therapy. Writing this helps me make a decision; I may just go ahead and frog it. After I knit the Central Park Hoodie. OK. I tried on the sweater and it is several inches too big under the arms so……off the needles it goes. Oh, well.